I have had spring fever and very little has been accomplished in the studio!…Not that I have done nothing at all, because I have been gathering and thinking about new ideas–the incubation stage of the creative process. 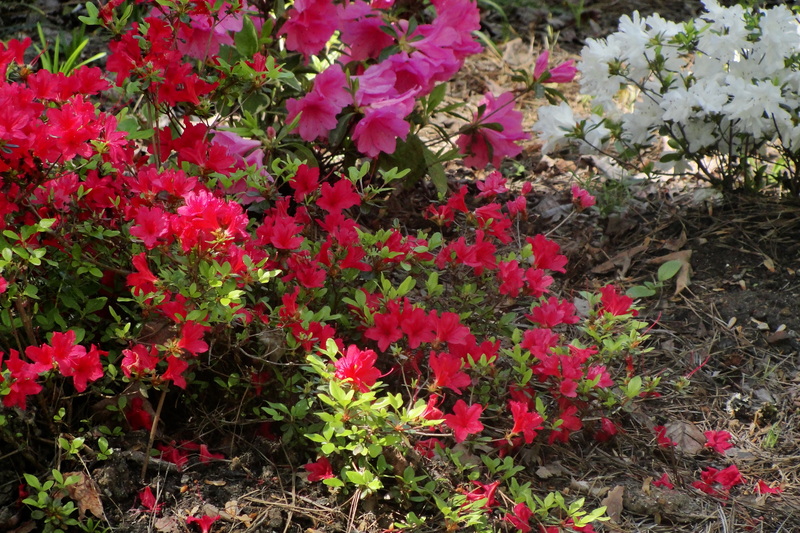 North Carolina Azaleas, © 2012, Joni Beach. While creative activities such as writing, painting, or quilting need this time, for me there can be a fine line between this stage and procrastination. I have a tendency to generate many ideas without moving on to the next steps of a) selecting one or two ideas, b) experimenting with new designs, techniques, and materials, in order to gradually follow through to c) a final design or piece of art. As in art, in life we can do the same–think about ideas, research possibilities, and make lists but have trouble taking the next step of trying out one or two options. Our hesitation may be due to a busy schedule, low energy, or fear of past failures. Finding the right timing or motivation can prove to be a challenge. When creating art or writing, I may first put on music, grind coffee beans to make a pot of coffee, and find a comfortable spot. The rhythm and routine of these small actions move me forward…toward the task. Fear of it not turning out like it is in my head has made me put things off. I just need to move forward. SCARY THOUGHT. Thanks for the insight. Joni, I am completely confident that you will find yourself moving into the studio and getting to your work at exactly the point when your “cup runneth over” with all this springtime inspiration. Thanks Robin…just wish they were in My yard! 🙂 The moving can be a challenge sometimes…but the “incubation period” is also important.